Following the selection of Apple's proposed design as the new nano-SIM standard last month, Financial Times reports that European carriers have begun stockpiling the new nano-SIMs in expectation that Apple's next-generation iPhone will be launching using the new standard in the coming months. Operators were caught off guard by the adoption of the micro Sim for the iPhone 4 as well as the original iPad two years ago, with some struggling to meet demand with their own micro-Sims in the first weeks of sale. Back in May, however, one iPhone parts vendor posted what was said to be the SIM tray for the next-generation iPhone, with the part appearing nearly identical to the micro-SIM tray found in the iPhone 4S. If that part is genuine, it would appear that Apple has either chosen to continue using the micro-SIM standard or has quickly changed course with the ratification of the nano-SIM standard to embrace the smaller design. Nano my arse. That's the biggest 1MB memory card in production. Looks like the nano SIM basically just eliminated the plastic edges around the metal part, why didn't they do that to begin with? News Flash: There are nano-sims. Could be for iPhone, might not be though. How about Apple supplies the SIM? Then, you just have to register it with the provider. Won't have the right codes. 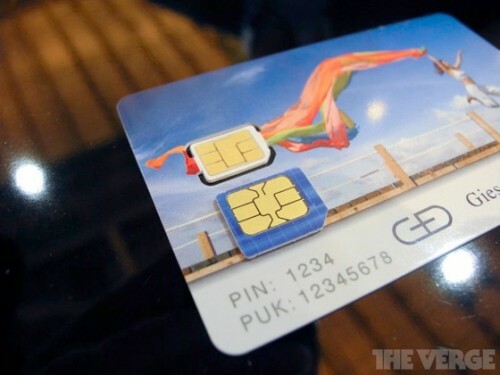 Can anyone explain why we actually have sim cards rather than some kind of internal chip? Would it not be easier to have a built in chip which just gets registered with whatever carrier you go with? Because Verizon and Sprint do that and they have proven again and again how it is a TERRIBLE idea. Like mini-DVI, mini-displayport and micro SIM you can always rely on Apple to make stuff redundant after very, very little time. iMac G5 with iSight Camera? NO here have some Intel iMac a few months later. And to think there are kids growing up today that will never see a Firewire cable. is this just a ploy to stop people cutting down regular sized sims to fit so that they can charge much more for 'iPhone' price plans...? To some extent maybe, but I believe it's more Apple trying to make more room for other components, like the battery for example. Not too much space, but inside an iPhone, a millimeter is like a mile in the real world.